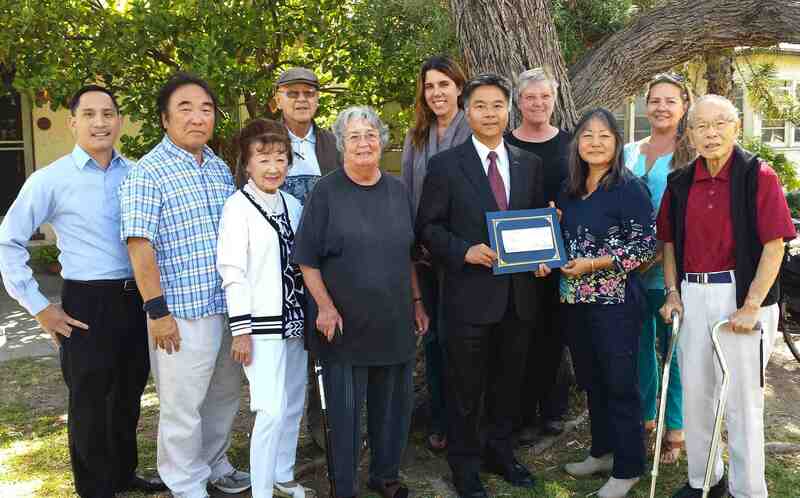 State Sen. Ted Lieu (D-Torrance) presented a check to the Venice Japanese American Memorial Marker Committee on May 20 at a private residence. The committee is a group of former internees and concerned citizens whose goal is to erect a memorial honoring Venice-area Americans of Japanese descent who were uprooted and imprisoned by the government during World War II. In 2011, Lieu and then-Assemblymember Betsy Butler co-sponsored Assembly Concurrent Resolution 46, which requested that CalTrans grant the VJAMM an encroachment permit to install the monument on the northwest corner of Venice and Lincoln boulevards. Pictured from left: Len Nguyen, field deputy for Los Angeles City Councilmember Mike Bonin of the 11th District, who has been helping the VJAMM since he was on staff for former Councilmember Bill Rosendahl; VJAMM Committee members Brian Maeda, Mae Kakehashi, Yosh Tomita, Emily Winters, Nikki Gilbert; Sen. Lieu; committee members Alice Stek, Phyllis Hayashibara, Suzanne Thompson, Arnold Maeda. Brian Maeda was born in Manzanar; Kakehashi, Tomita and Arnold Maeda were sent there in April 1942. For more information, visit http://venicejamm.org.